Fall is prime time for pumpkins. But instead of choosing the typical one that thumps its deep orange glow so readily on the outside, choose one that reveals its eye-popping color more shyly only on the inside instead. That’s kabocha for ya. Otherwise known as Japanese pumpkin, it’s squatty, a dull deep-green and rather weirdly knobby looking. But cut it open to reveal its intense orange-hued flesh that’s like a bright tropical morning sunrise. 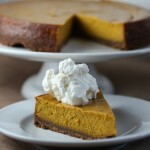 It’s my favorite hard squash for its incomparable sweetness and dry, fluffy texture akin to a chestnut or sweet potato. 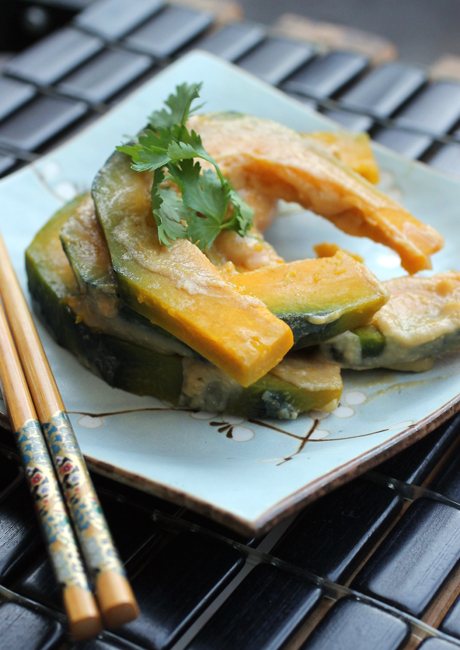 A wonderful way to prepare it is in this super simple dish of “Sake-Steamed Kabocha with Miso” from the new cookbook, “Japanese Farm Food” (Andrews McMeal), of which I recently received a review copy. 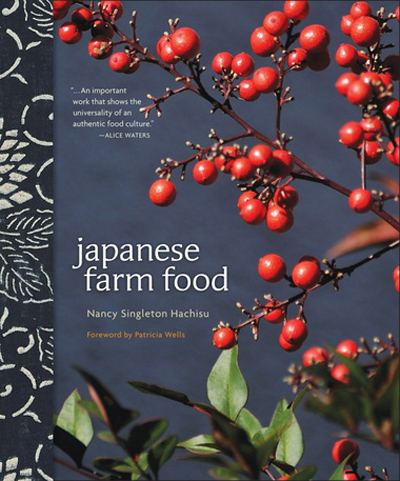 Author Nancy Singleton Hachisu moved from California to Japan in 1988, only planning on staying a year. But love intervened. She ended up marrying a Japanese farmer and immersing herself in the culture and food there. She, her husband and three sons live in an 80-year-old traditional farmhouse on an organic farm in rural Japan. Cutting up a whole kabocha takes a little bit of finesse since the exterior is so hard to penetrate with a knife. I make the job a little easier by microwaving the entire squash for a minute or two — until its skin softens just enough to get a chef’s knife or cleaver into it without breaking a sweat. Once you do that, the rest of the recipe is a cinch. 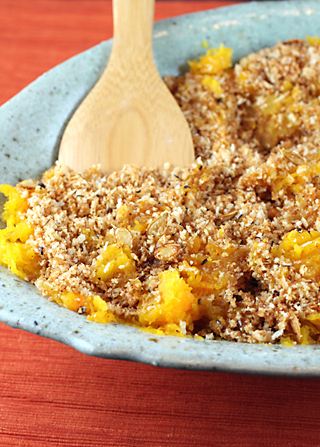 Just simmer thin slices of kabocha in a large skillet with dried red peppers and sake. 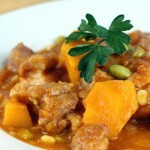 Once the squash is tender, stir in a mixture of miso and a little more sake. That’s it. The creamy, thick sauce is full-on savory-salty tasting — a perfect compliment to the sweetness of the kabocha. I garnished it with some cilantro just because I liked the herbal note it added. So, save those big Jack-O-Lantern pumpkins for porch decorations, and reach for the Japanese pumpkin for good autumn eats. Muddle the miso with 3 tablespoons of the sake in a small bowl. Peel the kabocha slightly, depending on the toughness of the skin, and slice into 1/8-inch thick pie-shaped wedges (Cut the kabocha in half from stem to stem, then again crosswise, and cut the thin wedges from those pieces.) Any long pieces should be cut in half crosswise, since they should be able to be eaten in one bite, no longer than 2 inches. Heat oil with the dried red peppers in a large wok or skillet over medium-low heat until peppers turn bright red and become aromatic. Throw in the kabocha and toss to coat the pieces with oil. Splash in the remaining 3 tablespoons of sake, and toss once to distribute. 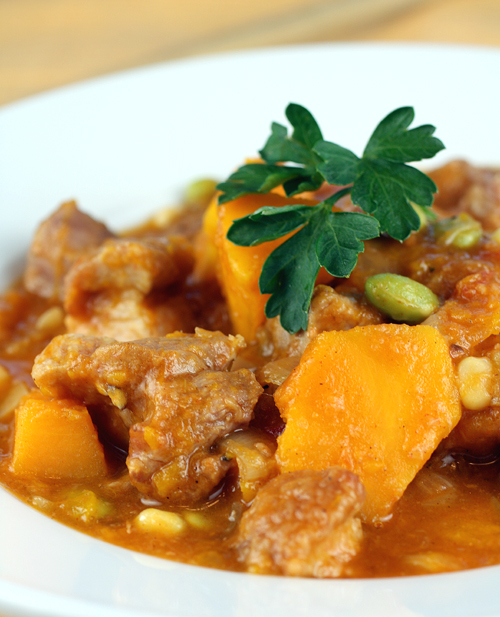 Cover and cook, stirring occasionally, for about 6 minutes, until kabocha slices have softened through to the skin. Add miso-sake mixture, stirring carefully to evenly coat the slices without smashing or breaking them. Serve hot, at room temperature, or cold the next day in a bento. A wonderfully homey dish. Love that combo. 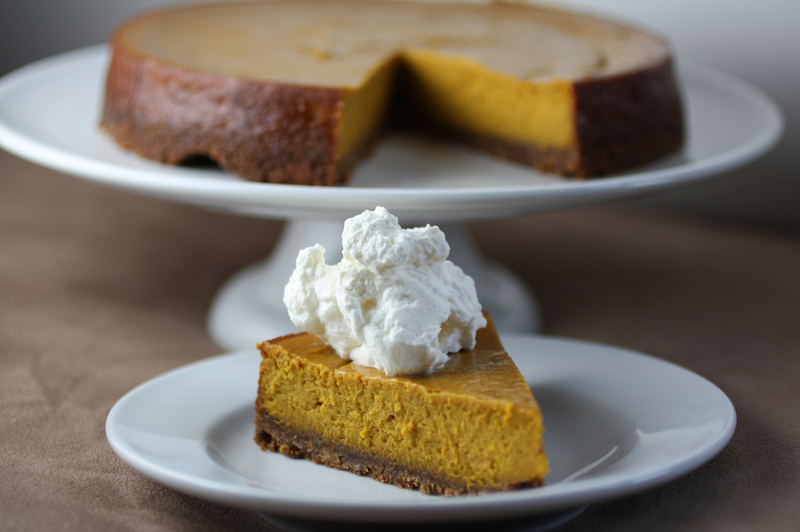 Carolyn, I love kabocha and I am always looking new recipe for it…I love the idea of miso and kabocha, how come I did not think of this before? Good idea on microwaving it first. I always wondered how to get through the tough surface. I just saw kabocha at the farmers market last week! Thanks for reminding me, I’ll have too cook with them soon. That Japanese potato salad sounds yummy too! I’ve seen this book’s review elsewhere and my friend also recommended this book. I need to grab one. When I refer “pumpkin” it’s usually kabocha and I have used only kabocha in my cooking and nothing else… I’ve never heard or tasted sake-steamed kabocha and I’m intrigued! Nami: This would be perfect for one of those beautiful bento boxes you make. 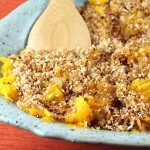 kabocha squash is one of my favorite varieties, and i love this straightforward preparation! You always have such interesting things to talk about! Love the recipe, and the book looks terrific. I’m beginning to dabble more with Japanese recipes, and this looks like a great resource. Thanks. I’m loving the simple, delicious dishes in this book. Can’t wait to try this one!